I have a rule which states that if a band has a song rated 5-stars on my ipod, I have to do everything in my power to see them live if they come within a 100 mile radius. The responsible song in this case is the lead single from Nada Surf’s 2002’s Let Go, ‘The Way You Wear Your Head’. I was not without reservation. Nada Surf first broke with ‘Popular’ (1996)… you know, the song where the guy reads out rules for teenage popularity during the verse. It was a good song, but a hard formula to follow and they would have been excused for becoming One Hit Wonders—which Elektra conspired to make them, dropping their follow-up album, ‘The Proximity Effect’ because they didn’t hear another ‘Popular’. They clearly weren’t listening hard enough, because ‘Amateur’ and ‘Bacardi’ are excellent, surprising, catchy songs. (I think ‘Bacardi’ is 4-stars on my iPod, but it’s pushing 5). 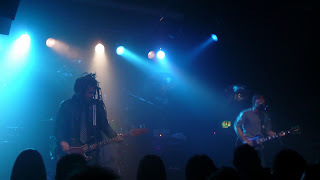 My reservations regarding their gig in 2008 come from the fact that Nada Surf have lived a second life since 2002. Let Go was more downbeat (‘The Way You Wear Your Head’ aside), more sappy lyrically (e.g. ‘Inside of Love’) and 2005’s The Weight Is A Gift took it one step further (e.g. ‘Always Love’) resulting in the appearance of their songs on The O.C. and One Tree Hill. Their latest album, Lucky, is very much in this O.C. groove: mellow, melodic, downbeat. So I was a little worried a) about the age of the clientele at the Garage last night (the tickets read “Over 14s”) and b) about the song selection for the actual gig. I mean, they do the mellow, melodic, downbeat well, but it’s less fun to stand stock still in a room surrounded by people with asymmetrical haircuts also standing stock still than to jump around to rock songs—at which point it doesn’t matter what type of haircuts people have: rock is the ultimate leveller. 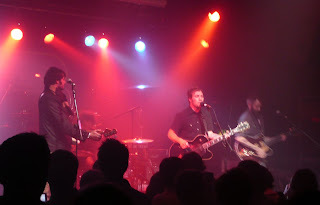 Before I could find out which Nada Surf I would be seeing, there was Rogue Wave, who were very ‘O.C. Nada Surf’. I actually listened to a few of their tracks on the net before the concert to decide how punctual I needed to be… and decided there was no rush to get to Glasgow for the start of their set. But we caught most of their set anyway, along with a diverse mix of ages and surprising lack of emo fashion statements. The problem with Rogue Wave, I think, was typified by their bass player (left), who was wrapped in a leather jacket with a big scarf over that. It can’t have been that cold up there (based on how much Matthew Caws was sweating an hour later), but he seemed to be on another planet: the least funky bass player I’ve ever seen. Contrasting with this comatose figure was the guitar tech (right) who also played all the extra parts that Studio Bands put into their songs which require extra hands to pull of live (lap steel, four different guitar tunings in one song…). This fifth member was tattooed, bearded and graying, and must have been 15 years older than the rest of the band, but he clearly loved his job. I don’t doubt Rogue Wave love the music they produce (in the studio?) and I know it’s hard being an opening band in any circumstance, but when your guitar tech is the only one sending the right vibe, something’s wrong. Their lacking stage presence was further underlined with Nada Surf’s appearance. They are clearly a band who’ve found their groove and like what they’re doing. Unfortunately for me, this groove is the one that does not include ‘The Way You Wear Your Head’ et al. But hey, not so fast, they still have some good songs, and even the ‘Love’ songs worked well in an anthemic way. There was crowd participation (soul band two-stepping, ooh-ooh-ooohs, the cussing part in ‘Blankest Year’). And songs from the new album which had felt flat on the first couple of listens suddenly made sense live. New light was also shone on ‘Ice On The Wing’, ‘See These Bones’ and ‘I Like What You Say’. They came on for multiple encores (my morning after memory is struggling to separate all the comings and goings and settle on two or three encores) was a bit contrived. Aside: an encore should be a treat, but I understand the lack of an encore would ruin most people’s nights, so a second encore must be the treat… We were a good crowd last night, but people were walking out the door when they came on for the last time… I’m glad they played all the songs they did, even working Joy Division’s ‘Love Will Tear Us Apart’ into the last song, but they didn’t have to leave and return to get us going: we were there. Considering they didn’t play the song that convinced me to outlay time and money to go to Glasgow to see them, the concert was not a disappointment. No regrets. Just good memories. The verdict: Eight Guitars out of Ten.